To our listeners, KNOM will remain the same, the uplifting, spiritual, quality, informative Catholic friend. Behind the scenes, however, April brought great change, as Fr. Mark Hoelsken, SJ, has stepped down as KNOM spiritual director, and as you will see below, two of his Jesuit brothers have offered to become the KNOM mission’s spiritual guides. 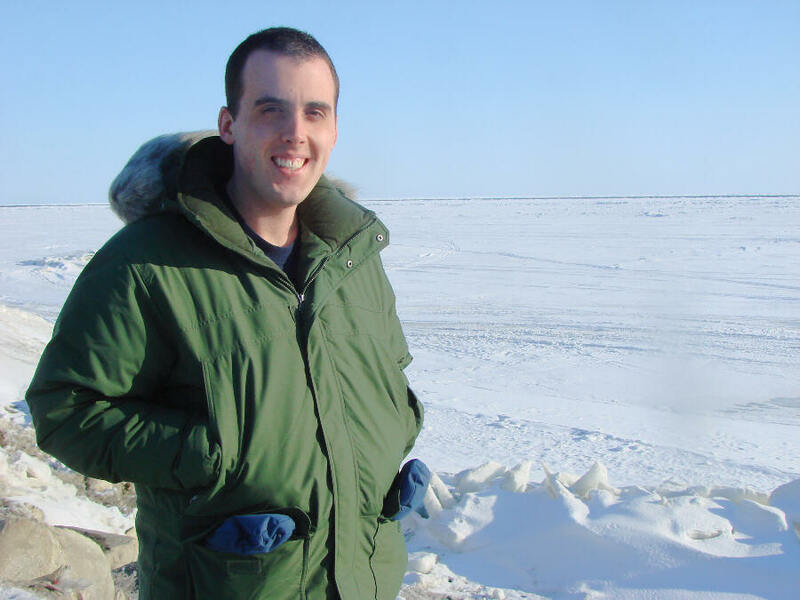 Father Mark has enrolled in a postgraduate communications studies program, and will probably be outside of Alaska for some time. It is a friendly parting, but as you can imagine, Father Mark will be greatly missed, both by us and by people throughout our vast coverage area. As we take this small step, we pause to thank you for your prayers and your faithful help for our mission work. God bless you for it! NEW SPIRITUAL ADVISORS: (Left) Fr. Armand Nigro, SJ, visits in the hallway of Anchorage’s Holy Spirit Retreat Center shortly after celebrating Mass.Father Armand, and his colleague, Fr. 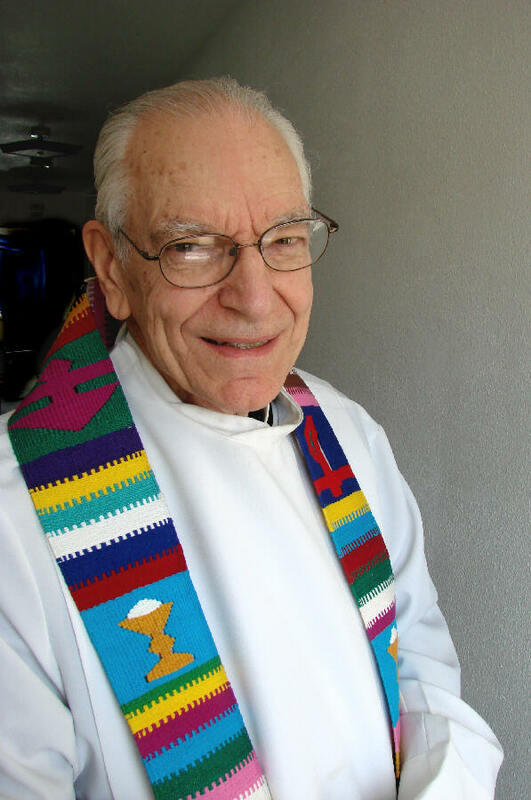 Vince Beuzer, SJ, have agreed to become spiritual advisors to the KNOM mission. Both are Spiritual Directors at the Center, respected priests of long standing. They counsel, as well as direct individual and group retreats. The KNOM staff, and general manager Ric Schmidt, are ecstatic. Though Father Armand has spent most of his ministry outside Alaska, he’s no stranger to the bush. As a young Jesuit, in 1951 he spent two years at the Holy Cross Mission, which served as an orphanage 240 miles southeast of Nome. At the time, the Mission was the only high school along the entirety of the Yukon River in Alaska. Thank you, Fathers Armand and Vince! A TABLEFUL: You can imagine what it took to wrap almost two dozen folks around the Schmidt family dinner table, as Ric and Lynette and family hosted the entire staff for Easter dinner. For many years, KNOM’ers have enjoyed Christmas and/or Easter meals at the general manager’s home. INSPIRATIONAL SPOT: Can you feel God’s encouragement? Can you sense in creation or in the presence of loved ones, or just in your heart that Your Creator knows you and approves of you? THE “ICE” HAVE IT! (left) KNOM volunteer inspiration director Dave Dodman checks out Nome’s ocean ice on a warm April day. Ordinarily, the Bering Sea at Nome loses most of its ice sometime in May. The half-mile closest to shore, however, often holds fast to the ocean bottom and doesn’t usually retreat until the first or second week of June. THIS DOES NOT COMPUTE: We are concerned that our computers tell us that soon. A series of eleven powerful computers help us control just about everything we do over the air. They hold our music, more than 8,000 songs. They hold all of our educational and inspirational spots, our news interviews, our Rosary and recorded Mass broadcasts, and virtually everything we play over the air. We use them to record and edit spots and other broadcasts, and we use them to schedule and play everything. They keep us on the air all night, working unattended. This month, our computer system turned 5 years old. That may not seem like long, but unlike our transmitter, which should last thirty years, and our other broadcast equipment, which should last ten to twenty years, computers are prone to fail after just five. By next month, we will know the cost of replacing them. It will be steep, probably around $80,000. In April, we received an unexpected gift of $20,400, which we have dedicated to this project. Can you help? LITTLE SOPHIA: Many of our friends have asked for news of Sophia Woyte, son of KNOMer Robyn Woyte. Sophia was born severely prematurely in October. The Woyte family, and everyone at KNOM, thank you for your prayers for this miracle child. KNOM — the oldest Catholic radio station in the United States — strong, thanks to you. INSPIRATIONAL SPOT: Great occasions to serve God and others come very seldom in our lives. But little ones surround us. A FOND GOODBYE: (left) Fr. 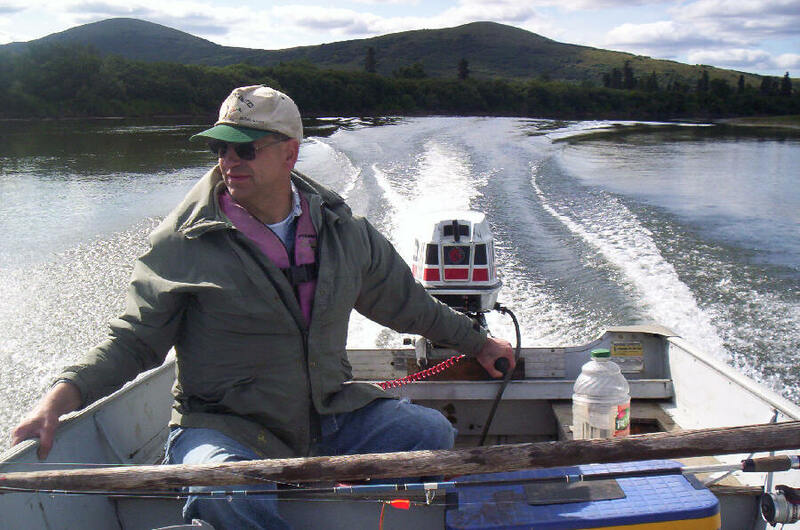 Mark Hoelsken, SJ pilots a small boat on the North Fork of the Andreafsky River in August 2006, 175 miles south of Nome. 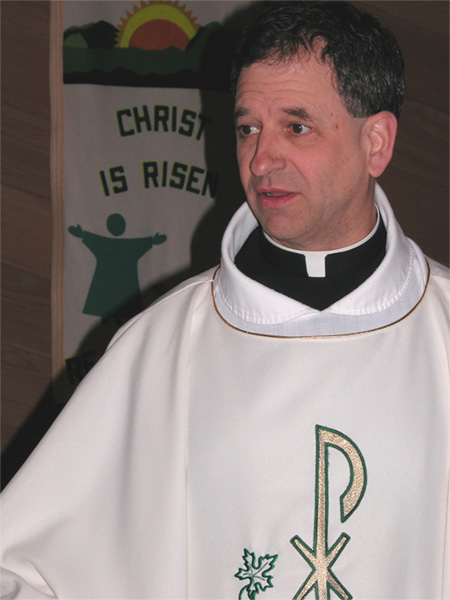 He’s been spiritual director for KNOM since 1998, and while he will remain a friend and in close contact, his priestly ministry now takes him elsewhere. Fr. Mark writes: “Though I have some regret on leaving my position with KNOM, I also feel encouraged because it is right for me to move on. And moving on makes me more certain that KNOM continues to have today a critical role in the development of the Church and society in rural Western Alaska. “The Church, thankfully, is moving steadily toward becoming more indigenous in this region. As such, leadership and ministry within the Church is shifting significantly into the hands of believers who are of the land. This trend echoes and supports larger contemporary movements of society, culture, politics and economics within the communities throughout rural Alaska. In general this accords, of course, with those concepts of justice and love which are central to our Christian faith and our Catholic tradition. (Left) As a lay KNOM Jesuit Volunteer, KNOM chief engineer Mark Hoelsken displays dinner he caught from beneath the Bering Sea ice at Nome. The photo was taken about 1977. (Left) Fr. 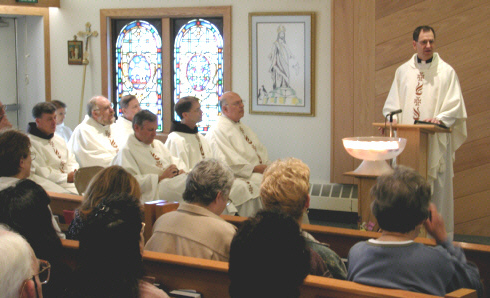 Mark celebrates Mass on the Feast of the Assumption, 2005. We will greatly miss Fr. Mark’s kind support, his presence, and his hearty laugh. He has promised to keep in touch, and we will hold him to it! His contribution has been immeasurable. Father Mark, wherever your spiritual journey takes you, may you ever be in Our Creator’s hands. (Left) On August 22, 2002, Fr. 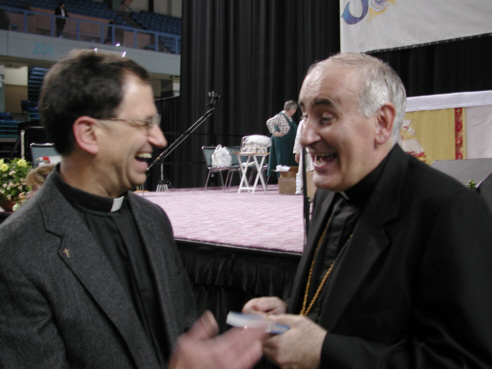 Mark Hoelsken, SJ shares a laugh with Fairbanks Bishop Donald Kettler shortly after the bishop's ordination Mass. Please consider adding the KNOM mission to your will. We prayerfully place all such gifts into funds for future major improvements, and to protect the mission in the event of an emergency. INSPIRATIONAL SPOT: May God bless you with discomfort at easy answers, half-truths and superficial relationships, so that you will live deep in your heart. May God bless you with anger at injustice, oppression and exploitation of people, so that you will work for justice, equality and peace. May God bless you with tears to shed for those who suffer, so you will reach out your hands to comfort them and change their pain into joy. And may God bless you with the foolishness to think that you can make a difference in this world, so you will do the things which others say cannot be done. INSPIRATIONAL SPOT: Forgiveness is not being a door mat. It’s opening the door. READY, AIM! 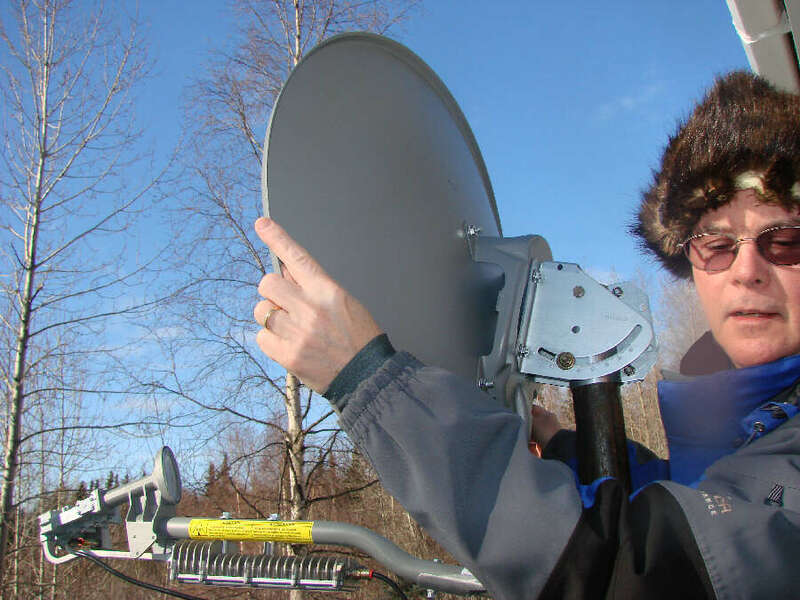 (left) In Anchorage in April, Tom Busch gently aims a HughesNet satellite dish. Tom was testing the system, which we hope will feed KNOM’s audio signal to our village translator transmitters. In the village of St. Marys, Tom also expects to install one of these satellite Internet systems for the Jesuit fathers. Please stay tuned! MUSIC! MUSIC! MUSIC! In late March and early April, KNOM public affairs director Amy Flaherty was 284 miles south of Nome, in the small town of Bethel for the Camai (juh-MY) Native Dance Festival, a spring feast featuring Alaska Native dancing and songs. “Camai” is a friendly hello in the Yup’ik language, often used when greeting people you haven’t seen in a long time. Amy interviewed many folks and recorded dozens of performances to add to KNOM’s repertoire of Alaska Native music, which already included 684 traditional songs. Generally, we play one an hour, and to many western Alaskans, they are a real treat. Look for pictures at www.knom.org. 8,000 MILES: Before long, that’ll be the trip KNOM volunteer Jesse Zink will be taking. After completing his second year August 1st, Jesse will leave Nome and head to Africa, probably to the Democratic Republic of the Congo. His intention is to help children, especially with AIDS-related problems. DANCING WITH THE STARS: For 3-year-old Gracie Woyte, daughter of KNOM’s Robyn, it was the dance of a lifetime, with Alaska Governor Sarah Palin at the inaugural ball held in Nome. FORTY YEARS AGO: As May 1967 begins, eight-foot snowdrifts surround St. Joseph’s parish rectory, which is headquarters for the fledgling Catholic radio mission. Once again, thank you so very much for your kindness to the isolated people whom we serve. You remain in our prayers. May Our Lord reward you and those you love abundantly.